Did you know that painting is not only an extremely enjoyable activity but can also have incredible effects on body and mind? For many, painting is a means to escape the stress of every day life. What might come as a surprise for some is that painting can even have benefits on your health! As research has shown, participation in painting can lower levels of anxiety and could be associated with better health and depression. Even during a short period of time, such as a weeks painting holiday in Italy, you will already feel the positive benefits painting has on your state of mind. 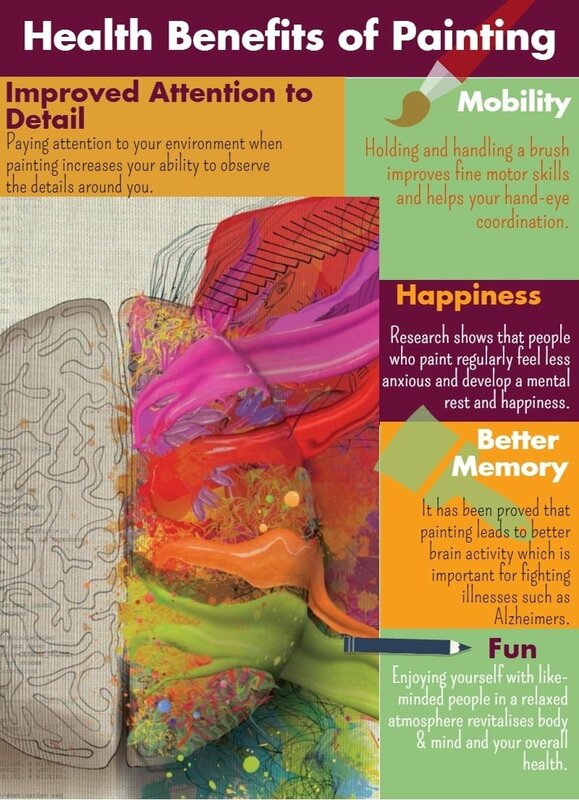 Our graphic below summarises the top health benefits of painting and might even inspire you to pick up this truly beneficial hobby! Are you ready to paint? You can easily start on one of our Italian painting holidays. Together with our experienced tutors you will have the time to really focus on your art whilst recharging your batteries in la bella Italia. Feeling inspired? Then contact our Flavours team here and get your painting journey started!